DNA11 FAQ | Need help or have questions about DNA fingerprinting or Artwork? At DNA 11, we’re here to help you through the process of creating the world's most original art. What can we help you with? How much is shipping & what are the delivery times? We have come up with a flat rate for FedEx shipments which start at $25 per item or $50 for a rush delivery $25.00. Normal Shipping - Kit ships within 5-7 days + 3 to 7 business days for delivery. Please allow up to 4 weeks for delivery of art print after returning the kit to us. Rush Shipping - Kit ships within 3 days + 3 business days for delivery. Please allow up to 4 weeks for delivery of art print after returning the kit to us. How will I collect my DNA? It's simple. Just follow our step-by-step directions for taking an effortless, painless sample of cheek cells using a special swab from your mouth. You'll find straightforward instructions in the collection kit we send out the day you place your order. Learn more about the process. Do you accept only cheek cells in the collection process? Cheek cells are the most common source of DNA samples because they're easiest to collect. However, we are able to process your DNA from a hair sample for an additional cost. Please contact us for additional information. Is each piece truly unique to every individual? Absolutely. The technique we employ would result in a unique genetic image for every individual in the world! No two pieces of art can ever be the same. We think that's the beauty of DNA portraiture. How do you ensure my security and privacy? How do I know that my artwork was made from my DNA only? As you might expect, we take great pride in ensuring the authenticity of every DNA portrait we create. We use fail-safe methods to track every sample we receive, and have strict processes for verifying that the secure tracking code on your artwork does indeed match your identity. In fact, we're so proud of our system we invited major media outlets including Discovery Channel and HGTV to tour our facilities. Are the art pieces signed? We don't sign the front of the artwork, because you are in fact the true artist. As such, we provide an option for you to add your signature to your art. What genetic information can be retrieved from my artwork? None. We do this on purpose to add an additional layer of security to your art piece. The standard procedure we use creates a unique, artistic representation of your genetic code, but it does not hold any specific information about your genetic makeup. There is no way that anyone can read the portrait to deduce anything specific about your DNA. Do you keep my DNA? No. Every sample is discarded in our secure lab facility immediately after an image is successfully captured. The destruction of your sample is a mandatory step in a highly secure process. Learn more about our privacy guarantee. Do you store my image? Your biological DNA sample is destroyed immediately after it is captured as a digital image. This digital image is stored but only for six months, and then it is permanently deleted. Should you wish for us to delete it sooner, just get in touch with us and we'll be happy to carry out your wishes. Storing an electronic image of your raw DNA Portrait can save you sampling and set-up costs should you decide to place a future order. Remember that the procedure we use creates a unique image, but does not store any information whatsoever about your genetic code. Scan our privacy and security policy for more information. Can I choose the color and size of my art piece? Yes. We have many options to allow you to express your personality while you match your décor! We have 25 unique color options. Be creative. All the choices are visible in our online store. If you would like a custom color created we can match any pantone color or paint code for you for an additional fee. Contact us for more details. What materials do you use to create the art piece? Each piece is a Giclée fine art piece, printed on high-quality, acid-free, polyester-cotton canvas, using pigmented inks designed to resist fading. Each piece is also sealed with a non-yellowing protective varnish to further prolong the print life. 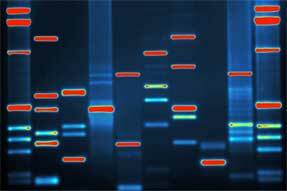 Can you make a DNA Portrait of deceased person? Yes. It's a common request. Many people take great comfort in having a DNA Portrait of a departed loved one. Working with about ten inches total of individual hair strands, we can capture a precise DNA image through a process called mitochondrial DNA extraction. Please contact us for more information. Can I make a DNA Portrait of my favorite pet? Effortlessly. A DNA Portrait of your companion is a beautiful way to celebrate the spirit of your friend. The process, like that for your human companions, is easy and painless (just a quick swab from the mouth). And the result is spectacular. The swab collects cheek cells so is best used on mammals such as dogs, cats and horses. How can I surprise someone with a DNA Portrait as a gift? DNA portraits make the perfect unique gift. We make it fun and effortless. When you order a DNA Portrait as a gift, we send you a slender, hinged, metal presentation box wrapped with a distinctive sleeve along with a gift card, instructions, collection kit and everything else your friend will need to get started. You do not need to select a color before ordering. You can wrap the presentation box as the symbol of your gift. Surprise! How much does it cost to have a DNA portrait made? Prices range depending on the size and style of the art piece you select. Contact us so that we can customize your art for you. Artwork is shipped within three to four weeks from the date we receive your DNA sample. It will take about ten days or less to receive your collection kit. The sooner you send your kit back to us, the sooner we can get started creating your art piece. Does my artwork come stretched? Your artwork comes ready to hang on your wall. Learn more about options here. Do you ship outside the U.S. and Canada? Yes. We also ship to all countries in the EU. We want you to purchase your custom art piece with the confidence of knowing that you will be 100% satisfied with your order. It's that simple. We at DNA 11 pride ourselves on providing the best customer experience with high-quality artwork and unparalleled customer service. If for any reason you are not fully satisfied with your DNA artwork, we will completely refund your order or offer you a reprint at no extra charge. How do I submit my fingerprint? Once you place your order, we send you an easy-to-use Fingerprint collection kit complete with instructions, fingerprint collection card, and ink strips. Once you've used the kit, simply mail us your fingerprints. Learn more about the entire process. Can I choose which finger I want to print? Yes. We're all about choice. The fingerprint collection kit lets you capture up to nine different fingerprints. Looking at your prints, you can then choose which fingerprints you want to turn into art. To see how the process works from start to finish please check out our video. How secure is it to submit my fingerprints? Even though you leave a copy of your fingerprints every time you touch any smooth surface, we take every precaution to ensure the privacy and security of your fingerprints. We do not share your information with any third parties, and only DNA 11’s professional staff handles all physical and digital files. We keep only a digital version of the fingerprint you selected for your artwork, and then only for six months, just in case you wish to have another copy made. All digital files are permanently deleted after six months. At your request, we will permanently delete your file at any time. Can I customize the color of my art piece? Of course. We have over a dozen recommended color options to choose from. You also have the ability to completely customize the color of your Fingerprint Portrait contact us to find out how! Can I combine more than one fingerprint on a single canvas? Yes. We can create a custom configuration for you. Contact us to find out how. We don't sign the front of the artwork, because you are in fact the true artist. There is an option where you can add your signature to your art. We do include a certificate of authenticity signed by the founders of DNA 11. Your artwork comes ready to hang on your wall. We have a wide variety of high-quality float frame options at competitive prices; you can make your choice when your order. How do I give a Fingerprint Portrait as a gift? Fingerprint portraits make perfect, unique gifts. And they're easy to give. We send you a slender, hinged, metal presentation box wrapped with a distinctive sleeve along with instructions, fingerprint collection card and ink strips. It's everything your friend will need to get started or to give as a gift. May I order a digital file of my Fingerprint? Yes. At the end of the order process you will be given the option to purchase a digital file of your Fingerprint Portrait that you can use as a screensaver, email to friends, or print yourself later. If you wish to purchase only the digital version of your Fingerprint Portrait, contact us for pricing. How long will it take to receive my Fingerprint Portrait? It will take seven days or less to receive your fingerprint collection kit by mail. Creation and delivery of your custom art piece will be up to four weeks from the date we receive your fingerprints back in our studio. Let us know if you need it for a specific date or in a rush and we will do our best to accommodate you. How do I submit my Kiss print? Once you place your order we will send you an easy to use KISS collection kit complete with instructions, Revolution Organics Lipstick, and special paper sheets that you press your lips against to collect the lip print. Once you've used the kit, simply mail us your KISS prints. Learn more about the entire process. Can I try several lip prints before choosing which one I like? Yes. The lip print collection kit allows for up to 25 different lip prints to be collected. You can then select the lip print you like best and send it back to our studio where it will be transformed into a beautiful piece of custom art. Is every KISS Portrait unique? Yes. Every art piece is as unique as you are. Lip prints-like fingerprints-are unique, so no two art pieces will ever be the same! Do you keep my KISS portrait on file? We keep only a digital version of the lip print you selected for your artwork, and then only for six months, just in case you wish to have another copy made. All digital files are permanently deleted after six months. At your request, we will permanently delete your file at any time. Of course. We have 25 recommended color options to choose from, but you can also contact us for custom colors. Does my artwork come framed? Your artwork will be shipped ready to hang on your wall. We have a wide variety of high-quality float frame options at competitive prices; you can make your choice when you order. How do I give a KISS Portrait as a gift? KISS portraits make perfect, unique gifts. And they're easy to give. We will send you KISS collection kit complete with instructions, Revolution Organics Lipstick, and special paper sheets that your friend uses to collect the lip print. You do not need to select a color before ordering. May I order a digital file of my KISS Portrait? Yes. At the end of the order process you will be given the option to purchase a digital file of your KISS Portrait that you can use as a screensaver, email to friends, or print yourself later. If you wish to purchase only the digital version of your KISS Portrait, no problems! Give us a call. How long will it take to receive my KISS Portrait? It will take seven days or less to receive your KISS collection kit by mail. Creation and delivery of your custom art piece will be up to four weeks from the date we receive your lip prints back in our studio. FAQs didn't answer your question? Contact us.